As you’ll know from the February voucher reveal post this month’s gift was a Ready Steady Cook challenge. 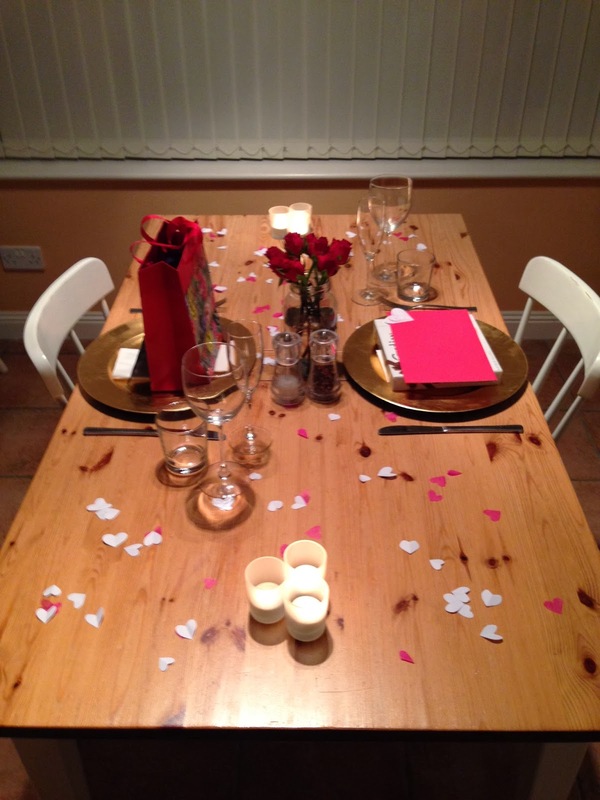 This year it was my turn to organise a Valentine’s date, so I decided to combine the two to create a Valentine’s themed Ready Steady Cook. Originally Nick was allowed £10 to spend on ingredients for the challenge, but with it being a special occasion, I upped the budget to £15. Whilst Nick was out shopping, I set the table. As I had no idea what we would be eating, I covered all bases by getting out large plates, small plates, bowls, glasses and all sorts of cutlery! Decoration wise, I went with white and pink heart confetti (homemade! ), large gold charger plates and a bunch of red roses in a Kilner jar, all topped off with plenty of candles. Nick turned up with the ingredients (which I wasn’t allowed to see) and I showed him the ‘Rules’ sheet so he knew what I was and wasn’t allowed to do! Nick set up the ingredients he had bought. After I’d been shown the ingredients, I had ten minutes to design a three course meal, and I’m rather proud to say I did it in just under 5 minutes. The rule of an hour’s cooking time works, but you have to use a timer and stop it as soon as each course is plated, starting it again when you begin cooking the next course. This is purely because otherwise you’d have three courses all ready at once, all steadily going cold! If you’re thinking of trying out a Ready Steady Cook evening, I throughly recommend it. We had so much fun (even if I was a little bit flustered at times! ), so much so that Nick has decided he wants to have a go himself! Whatever you got up to this Valentine’s Day, I hope you had a day filled with love, be it from your other half, friends, family or even the cat.